The maxillofacial traumatic injuries often occur in association with dental trauma. An epidemiologic study of Gassner et al. revealed an incidence of 48.25% for dental injuries in all facial trauma. According to this study, the literature states a mean prevalence of 50% [2, 3]. Moreover, the severity of dental traumatic damage, in patients who have a combination of dental injury and majormaxill ofacial injury, is usually different from those in which a simple dental trauma occurs . The type of dental primary dentition most frequent damage is the subluxation, the uncomplicated crown fracture usually occurring in permanent teeth . The literature recognizes that incisors are frequently affected from coronal fractures (18-22% of all dental traumas), with the prevalence of 96% referred to central maxillary incisor [1, 5-7]. In this kind of fractures, the loss of mineral structure involves only the enamel or both the enamel and the dentin, without any pulp exposure. Various techniques and materials have been proposed and used to restore enamel-dentin fractures, depending on different clinical situations. The missing tooth portion can be restored by means of a direct restoration, using composite resins or indirectly choosing lab processed composite or ceramic inlays . In the age of the minimal invasive and conservative dentistry, when a correctly preserved fractured portion is available, the adhesive reattachment to the residual tooth structure should represent the first treatment choice. The clinical success of this procedure, that allows re-using the original fragment, is enhanced by the improvement, in reliability and effectiveness, of modern adhesive systems.The presence of supra gingival margins is a basic condition to perform the fragment reattachment. In this case, the fractured surface is visible and, for this reason, easy to access . Based on our experience, the fragment should be stored in a medium in order to avoid dehydration and possible discoloration. Some authors suggest storing it in physiological solution at 37° C. in a closed container . The fragment reattachment technique has many advantages over traditional restorative procedures because it is more conservative and it offers the clinician the possibility to re-establish the contour, the architecture, and the tooth’s original brightness . When the fracture is associated with pulp exposure, it is classified as a complicated fracture and an endodontic treatment can be considered before the direct fragment reattachment technique is performed. In this case, a careful evaluation of the biological width and a minimal invasive endodontic access must be performed in order to obtain a long-term clinical success. Fragment retention is significantly correlated to the technique and to the restorative materials used for the reattachment treatment. A number of operative procedures have been reported in literature, from little or no additional tooth preparation to various preparation options such as: placement of a circumferential bevel, placement of an internal groove, placement of an external chamfer, use of a superficial over-contour of material on the fracture line . The authors have evaluated the functional and aesthetic outcomes, the versatility and the long-term stability of a tooth fragment reattachment technique without additional tooth preparation used to restore crown fractures just using bonding agent. A prospective clinical study was performed between 2007 and 2015 in Department of Dentistry at the University of Messina. The study included 9 patients (5 males, 4 females) with tooth coronal fracture. In all the cases, the fractured fragment was available and intact and there were not macroscopic losses of dental tissue at the tooth-fragment interface. For each patient, the clinical evaluation was carried out during a 4 years observation period. The teeth involved showed no evidence of caries, pulpal pathology or periodontal lesions consequent to the dental injury. The clinical status of the injuries is summarized in (Table. 1). Table 1. Baseline clinical status. The fractured portion, evaluated sufficiently intact and with adequate margins and structure, was disinfected with 0.2% chlorexidine and temporarily stored in physiological solution to obtain the hydration. An accurate evaluation of the fractured tooth was performed Figs. (1a - 2a). Vitality and mobility tests were useful to reveal a possible dislocation injury or the interruption of nerve and blood supply to the pulp. A periapical radiograph was performed (Figs. 1b, 2b, 1e, 1f, 2e - 2f). Fig. (1). Patient # 3 (a - baseline rx control; b - fractured tooth; c - 12 months Rx control ; d - Clinical appearance after 12 months; e - 36 months Rx control; d - Clinical appearance after 36 months. Fig. (2). Patient #6 (a - fractured tooth; b - baseline rx control c - 12 months Rx control ; d - Clinical appearance after 12 months; e - 36 months Rx control; f - Clinical appearance after 36 months. The first step of the operative procedure, after local anaesthesia, was the isolation of the operating field with a rubber dam in order to avoid the negative effects of saliva and gingival crevicular fluid on the adhesive system. Prior to the reattachment procedure, the fractured tooth was cleaned and polished and the fractured portion was “tried-in” many times attempting to adapt the fragment in the right position and to verify the absence of disruptions or defects between the remaining tooth structure and the fragment itself. To facilitate the fragment’s handling, it was fixed on its vestibular aspect to a holder with an adhesive tip (Pic-n-stick, Pulpdent Corp.). Subsequently, the fragment was etched with 37% phosphoric acid gel and rinsed after 30 sec (30 for enamel,  for dentine) Fig. (3). The adhesive system was then applied on the etched surface and the fragment was kept away from light or heat sources till the reattachment phase (Fig. 3). Fig. (3). (a - buccal view; b - occlusal view; c - fractured fragment; d - fragment adaptation; e,f - adhesive procedures of the fragment). Also the remaining tooth structure was treated with an “etch and rinse” technique using a 3-step universal dental adhesive system (All-Bond BISCO) (Fig.4). The fragment was thus placed in its proper position on the tooth under magnification (4X) to achieve the perfect fit between the two parts and only at this point, the bonding agent was photo-polymerized . During the polymerization, it is essential that the fractured portion is not moved. The polymerization was carried out on both the labial and lingual aspects using a LED light (T-LED dna Anthos) with increasing light intensity (100 mW/cm2 for 10 sec; increasing intensity for 10 sec; 500 mW/cm2 for 20). Then the restored tooth was finished and polished using silicon points with a decreasing granulometry (HiLuster Plus Identoflex, KerrHawe) (Fig. 4). Discoloration of the fragment or marginal pigmentation (Figs. 1b, 1c, 2b, 2c) (Table 2). Table 2. Clinical reattachment follow-up after 12 and 36 months. Fig. (5). Shows the survival rate during the follow-up period. The examined variables are categorical and, so, are expressed as number and percentage. For data analysis, the non-parametric approach was used because of the low sample size. Both for complications and for detachment (and their combination), the McNemar test was applied in order to assess the differences between paired proportions; in particular, we performed comparison between baseline vs 12 months Fig. (2d) and baseline vs 36 months (Fig. 1d). Statistical analyses were performed using SPSS 17.0 for Window package. P< 0,05 was considered to be statistically significant. In the sample analyzed, the dental trauma was related in 22.2% of cases to a maxillofacial trauma. The coronal fractured tooth sample was composed by incisor (Superior: 6 centrals, 2 laterals; Inferior: 1 lateral). In 55.5% of the patients, dentinal sensibility was referred, associated, in one case, with slight pulp exposure. The 44.4% of trauma was totally asymptomatic. Within one year of the trauma, only one case of fragment detachment was reported; in the same case (11.1%), dentinal sensibility was present, with other teeth being totally asymptomatic. In all the cases, no endodontic lesions were recorded. The teeth responded normally to vitality tests and were non-tender to pressure and percussion. The periapical radiograph showed no widening of the periodontal space and an intact lamina dura. At 3-years follow-up, a new case of fragment detachment was recorded. In 11.1% of cases, marginal leakage with infiltration, associated to marginal discoloration was recorded. All teeth responded normally to vitality tests. When we compare compliance at baseline vs 12 months and 36 months, no difference exists (p=0.125 and 0.375, respectively). Focusing our attention on the detachment, we found a significant change in comparison between baseline vs 12 months (p=0.008) and vs 36 months (p=0.016). Finally, analysing compliances and detachment together, we found a significant change in comparison between baseline vs 12 months (p=0.008) and vs 36 months (p=0.031). In our prospective clinical study, the crown fracture associated to maxillofacial trauma was observed in 22.2% of our patients. H. Thore et al. Stated in a retrospective study on 389 patients with facial fracture referred an incidence of 16% of dental injuries. In a study by Robert Gassner et al., 1 in 6000 patients with facial injuries reported an overall incidence of 48.25%. In our case series (uncomplicated fractures with intact margins of teeth and fragment), the most prevalent fracture site was the maxillary incisor region (88.8%). Dentinal sensitivity was the most common complication (55.5%) with a single case of slight pulp exposure. In one patient, a subluxation was observed. Our case series underlines the positive aspects of the reattachment technique used on fractured teeth. The choice of the reattachment treatment without additional preparation was determined by the absence of macroscopic losses of dental hard tissue at the tooth-fragment interface. Demarco et al. and Reis et al. stated the necessity of the application of a bevel, a chamfer or an over-contour to improve the fracture resistance after reattachment treatment [14, 11]. Another study by Reis et al. concluded that an internal groove and over-contouring determined a better resistance to fracture of reattached teeth . The fracture resistance reached 90% of the control resistance and this finding could be related to the surface area of adhesion. Wiegand et al. suggested the use of an internal groove when the residual dental structure and the fragment fit perfectly; otherwise a overcontour is advisable when there is a partial loss of hard tissue  . However, some authors reported in clinical follow up that it is not necessary to use additional tooth preparations to ensure clinical success [16-21]. Reis et al. and Pusman stated that the amount of strength recovery needed for long-term fragment retention remains unknown, and suggested that fracture strengths as low as 50-60% may be sufficient for clinical success [14, 22]. Moreover, many studies performed on animal or human specimens have not found, at the moment, an agreement on the testing protocol as far as load speed, force direction and specimen preparation are concerned. Therefore, there is no clear clinical evidence that any type of tooth preparation can really improve the fracture strength of the reattached fragment. The long-term results and clinical observations show two cases of detachment observed at 12 months and 36 months follow-up respectively. In the last one, the detachment occurred after a new trauma. 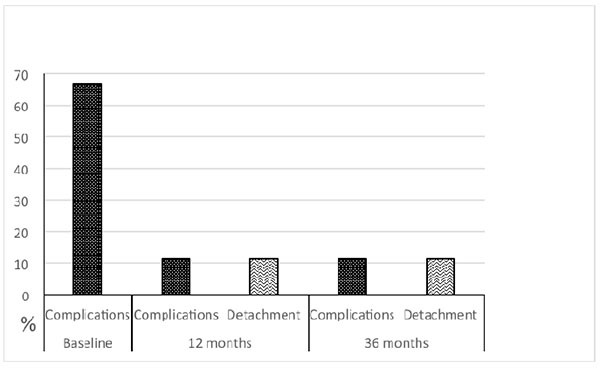 The statistical analysis showed the significant data of the direct fragment reattachment technique during the observation time (12 months p=0.008; 36 months p=0.016). According to Munksgaard et al., the primary cause of failure of the reattached tooth fragment is a new trauma or the use of the restored tooth with excessive masticatory forces . The incidence of complication (sensitivity and marginal discolaration) after one and 3 years was 11.1%, with a reduction of the baseline values (66,6%). In the patient with marginal discoloration (only 1 patient about 11.1%), periodontal inflammation was also observed due to poor hygiene. So no significant relationship of discoloration and periodontal disease has been recorded. The improvement of generally evaluated compliances was substantial both after 12 months (p=0.008) and 36 months (p=0.031). The results of long-term follow-up and clinical observations confirm, in our case series, that the reattachment technique is predictable and reliable and easy to reproduce. The direct fragment reattachment technique is an effective and an excellent alternative to direct and indirect restorations. This reattachment technique, besides its aesthetic qualities (no composite restoration can accurately reproduce the optical properties and the characterizations of the dental structures), is faster to perform when compared to the direct restoration technique because it permits to avoid all the prosthetic steps related to the realization of a silicon matrix mandatory to correctly model the restoration palatal surface and to create a base for the subsequent composite’s layering. 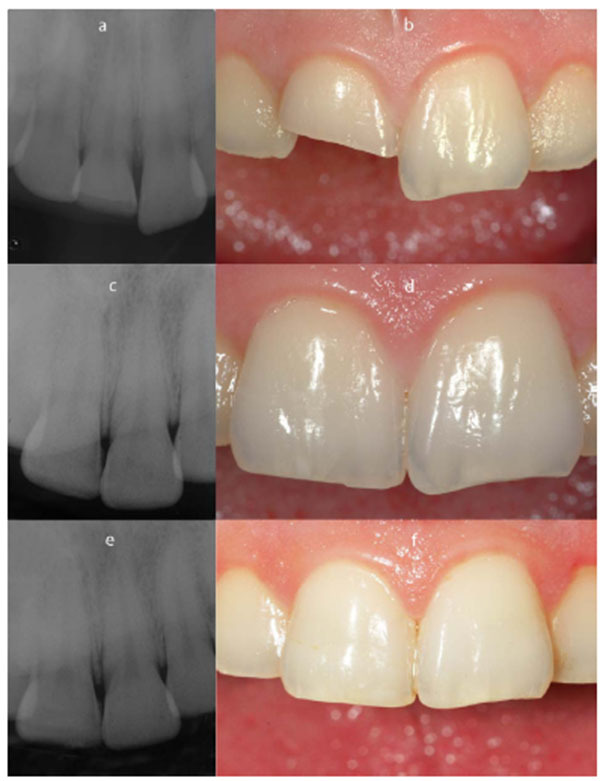 The direct fragment reattachment technique compared to the prosthetic techniques (veneers and crowns), besides being more conservative, can produce immediate results without the need of various laboratory procedures, generating better patient compliance. The good long term clinical results underline that how this technique is easy to standardize and perform, that it is inexpensive and that it allows a perfect aesthetic recovery and functional restoration of the fractured element, not underestimating the significant preservation of the dental structure. in accordance with the literature. Moreover, a small pulp exposure is compatible with direct fragment reattachment technique that can preserve the tooth vitality eliminating the need of a endodontic therapy. This procedure is flexible and permits minimally invasive therapy taking advantage of dental adhesion and allowing the restored tooth to obtain a fracture resistance compatible to the functional stress of a sound tooth. This therapy is particularly appropriate in case of associated maxillofacial trauma, because it is minimally invasive and fast and easy to perform. The analysis of the clinical results exhibits the interesting aesthetic and functional significance of this technique confirming that the adhesive reattachment is the best treatment for an enamel-dentin fracture when the tooth fragment is available, sufficiently intact and well preserved. Gassner R, Bösch R, Tuli T, Emshoff R. Prevalence of dental trauma in 6000 patients with facial injuries: implications for prevention. Oral Surg Oral Med Oral Pathol Oral Radiol Endod 1999; 87(1): 27-33. Thorén H, Numminen L, Snäll J, et al. Occurrence and types of dental injuries among patients with maxillofacial fractures. Int J Oral Maxillofac Surg 2010; 39(8): 774-8. Gassner R, Tuli T, Hächl O, Rudisch A, Ulmer H. Cranio-maxillofacial trauma: A 10 year review of 9,543 cases with 21,067 injuries. J Craniomaxillofac Surg 2003; 31(1): 51-61. Shayegan A, De Maertelaer V, Vanden Abbeele A. The prevalence of traumatic dental injuries: A 24-month survey. J Dent Child (Chic) 2007; 74(3): 194-9. Abdulkhayum A, Munjal S, Babaji P, et al. In-vitro evaluation of fracture strength recovery of reattached anterior fractured tooth fragment using different re-attachment techniques. J Clin Diagn Res 2014; 8(3): 208-11. Uddin MF, Naser M, Howlader MM, et al. Changing concepts in reattachment of tooth fracture. Updat Dent Coll J 2012; 2: 42-6. Kaste LM, Gift HC, Bhat M, Swango PA. Prevalence of incisor trauma in persons 6-50 years of age: United States, 1988-1991. J Dent Res 1996; 75(Spec No): 696-705. Eden E, Yanar SÇ, Sönmez S. Reattachment of subgingivally fractured central incisor with an open apex. Dent Traumatol 2007; 23(3): 184-9. Rappelli G, Massaccesi C, Putignano A. Clinical procedures for the immediate reattachment of a tooth fragment. Dent Traumatol 2002; 18(5): 281-4. Dietschi D, Jacoby T, Dietschi JM, Schatz JP. 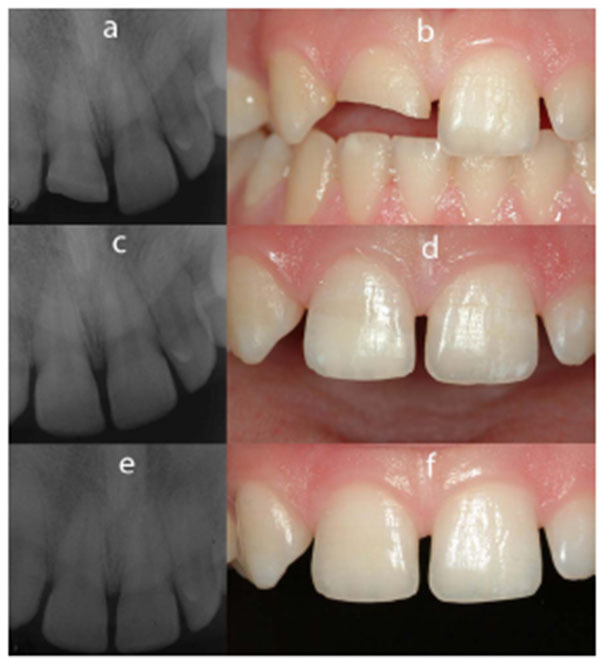 Treatment of traumatic injuries in the front teeth: restorative aspects in crown fractures. Pract Periodontics Aesthet Dent 2000; 12(8): 751-8. Demarco FF, de Moura FR, Tarquinio SB, Lima FG. Reattachment using a fragment from an extracted tooth to treat complicated coronal fracture. Dent Traumatol 2008; 24(2): 257-61. Arhun N, Ungor M. Re-attachment of a fractured tooth: A case report. Dent Traumatol 2007; 23(5): 322-6. Lo Giudice G, Lo Giudice R, Matarese G, et al. Evaluation of magnification systems in restorative dentistry. An in-vitro study. Dent Cadmos 2015; 5: 296-305. Reis A, Francci C, Loguercio AD, Carrilho MR, Rodriques Filho LE. Re-attachment of anterior fractured teeth: Fracture strength using different techniques. Oper Dent 2001; 26(3): 287-94. Reis A, Loguercio AD, Kraul A, Matson E. Reattachment of fractured teeth: A review of literature regarding techniques and materials. Oper Dent 2004; 29(2): 226-33. Wiegand A, Rödig T, Attin T. Treatment of crown fractured incisors: Reattachment instead of restoration. Schweiz Monatsschr Zahnmed 2005; 115(12): 1172-81. Demarco FF, Fay RM, Pinzon LM, Powers JM. Fracture resistance of re-attached coronal fragments--influence of different adhesive materials and bevel preparation. Dent Traumatol 2004; 20(3): 157-63. Badami AA, Dunne SM, Scheer B. An in vitro investigation into the shear bond strengths of two dentine-bonding agents used in the reattachment of incisal edge fragments. Endod Dent Traumatol 1995; 11(3): 129-35. Munksgaard EC, Højtved L, Jørgensen EH, Andreasen JO, Andreasen FM. Enamel-dentin crown fractures bonded with various bonding agents. Endod Dent Traumatol 1991; 7(2): 73-7. Dickerson WG. Conservative reattachment of a pulpally exposed, fractured incisor. Dent Econ 1994; 84(4): 90-1. Pusman E, Cehreli ZC, Altay N, Unver B, Saracbasi O, Ozgun G. Fracture resistance of tooth fragment reattachment: Effects of different preparation techniques and adhesive materials. Dent Traumatol 2010; 26(1): 9-15.